Unlike most romance stories, “Engagement” begins with the perfect couple already together. Tom (Segel) and Violet (Emily Blunt) are clearly soul mates, and when they decide to get married, it seems like the most natural thing in the world. Yet as they start planning the wedding, life invariably gets in the way; Violet, a psychologist, gets a prestigious graduate position at the University of Michigan, forcing the couple to relocate from San Francisco, where Tom is a successful chef. Tom agrees to move because he loves Violet, but as he grows increasingly miserable in a town with no culinary career opportunities, their relationship becomes strained, and the wedding is delayed again and again as the years pass by. It’s an inherently sad story about how even the truest of loves can be thwarted by the personal nature of identity, and the narrative cuts so close to real life in depicting these painful issues that few viewers will have trouble relating. That’s the film’s greatest strength, but in choosing to orient the action comedically, it’s also the Achilles’ heel. Finding moments of levity in the midst of dark, heavy material isn’t just difficult, it’s often impossible, and to keep the laughs coming, Stoller and Segel create unnecessary scenarios or convolute the story in ways that feel disingenuous. In most of those moments – primarily revolving around Tom’s dark identity crisis or Violet’s surprisingly silly academic fellowship – I just don’t feel like laughing, because the material itself primes me to feel empathetically sad. When the comedy takes a back seat and we’re instead treated to serious, honest depictions of the toll life takes on Tom and Violet’s romance, the film is fantastic, but those moments are too few. Nevertheless, the film is strengthened throughout by two tremendous lead performances by Segel and Blunt; though Segel has starred in more comedies and Blunt in more dramas, they are both excellent dramatic actors capable of gut-busting hilarity, and they put all their skills to good use here. Their chemistry is exquisite, subtle and understated but always genuine and palpable, and the film is worth a watch just to see these two interacting. One of the film’s bigger failings, though, is that once the couple moves to Michigan, it fails to populate their world with interesting side characters. In fact, I actively detested most of the film’s supporting players; Tom and Violet’s friends all come from the stock guide of ‘quirky companions,’ and the ones who aren’t distracting or annoying are just downright unappealing. Case in point: Rhys Ifans plays Violet’s boss at the Psych department, and is so spectacularly insufferable that I found myself resenting Violet for ever coming in contact with him, let alone developing inexplicable romantic feelings. Despite Segel and Blunt’s strong work, the tonal inconsistencies and obnoxious supporting characters makes their story a chore to watch in some stretches, and leads me to make a complaint I’ve never before lodged at a comedy: I wish the film would have been about Alison Brie and Chris Pratt’s characters. 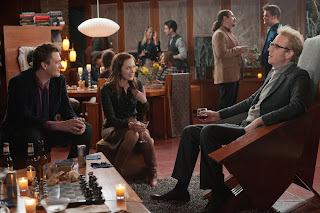 Pratt plays Tom’s best friend in San Francisco, Alex, and Brie plays Violet’s sister, Suzie. If you watch “Parks and Recreation” or “Community,” you know that Brie and Pratt are two of the most incredible comedians working today, and they completely steal the show whenever they turn up here. Brie, in particular, is just radiantly funny, with flawless comic timing and a British accent that serves as the greatest Emily Blunt impression the world has ever seen. 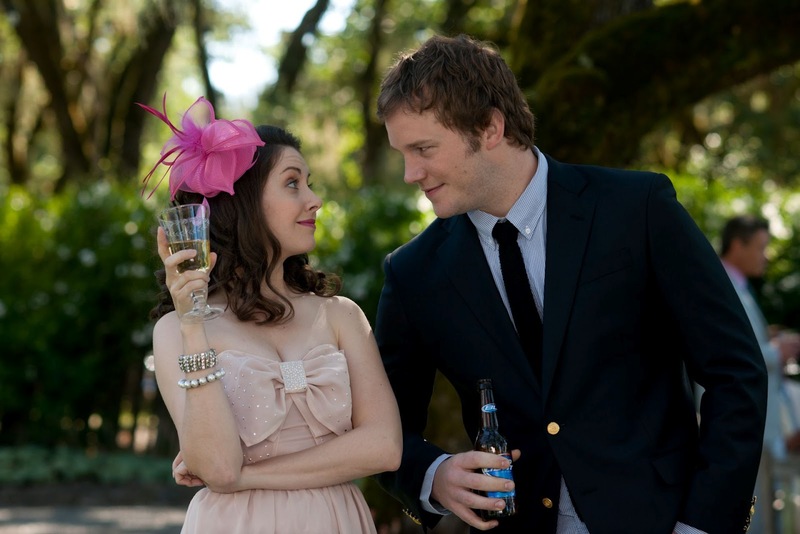 Their side-story – Suzie and Alex’s one-night stand at Tom and Violet’s engagement party leads to pregnancy and marriage – happens to be the script’s healthiest narrative ingredient, and I found my interest in the film rising exponentially whenever Brie or Pratt made an appearance. Their story is far riper for comedy than Tom and Violet’s, while still leaving room for dramatic human exploration, and by the time the credits rolled around, I regretted I hadn’t watched a film about their characters. Oh well. “The Five-Year Engagement” is far from a perfect movie, but I still think it’s worth seeing. I love the thematic ambition, the dramatic moments work wonders, I adore the four main performances (even if two of them are underutilized), and even if much of the humor didn’t work for me, I certainly laughed more than I do at many lesser comedies. Though it’s easily the duo’s weakest film to date, “The Five-Year Engagement” does nothing to diminish my faith or enthusiasm for Segel and Stoller’s work, and I’m very eager to see where they go from here. This is a very touching movie. It made me reminisce my own wedding held at the Long Island country club. It was a pretty long engagement too and now we're happily married.